4 Corner IT is an IT company and Managed Services Provider headquartered in downtown Fort Lauderdale. If you’re looking for a Miami, West Palm Beach, or Fort Lauderdale based computer and network support company we offer business-class support and services to all of South Florida. Our team is made up of engineers, technicians, and network systems administrators. For over a decade we have been bridging the gaps of technology for companies of all sizes looking for an edge over their competitors. 4 Corner IT, previously “Intermakers”, was founded in Broward County, Fl in 2000. 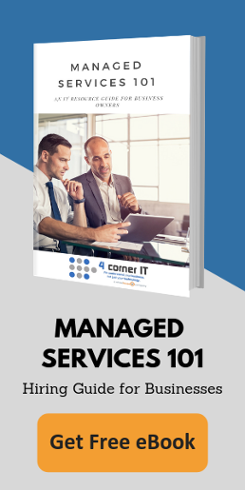 After acquiring CDS Systems of South Florida in 2005 and several expansions later, we’ve merged into the full service IT company known as 4 Corner IT in 2007. We now provide IT support to all of Broward, Miami-Dade, and Palm Beach County as well as New York City and Long Island, NY, and now Los Angeles, CA. Our company’s main focus is on flat fee computer and network support services. As technology and the demand of our clients evolve, we continue to evolve with them. Many computer and network support organizations offer similar services and it can be hard to determine what distinguishes one from the other. We offer a free consultation so you can learn what set us apart from the others – beginning with our friendly, knowledgeable support specialists. At 4 Corner IT our success is based on the success of your business. Supporting and managing your technology will always be our main focus, and now thanks to expansions and partnerships we are able offer an even wider range of services, which means eliminating costs for otherwise unknown IT support management costs. Contact us for a consultation and quote.